There are already several chess clubs in the Greater Manchester area. Why have we created a new one? Firstly, these clubs are not in central Manchester and readily accessible by public transport. The club is well located for people who live and/or work in Manchester. It is a quick walk to Manchester Piccadilly, Manchester Victoria and easily accessible via the bus and Tram network. We’re Greater Manchester’s best located club for several hundred thousand of the population! Secondly, we don’t do rated games*. The traditional clubs do a great job in serving the needs for club players who want to play rated games. Rated games are fantastic, but they typically involve sitting silence for three hours, are quite serious, and are not especially social. They are also often not suitable for players who haven’t already reached quite a high level of play. How is the club different? You can literally just walk in and play, any Tuesday. We’re free. Technically speaking it is probably more a gathering of chess players than a ‘club’. We have no membership list and thankfully no AGMs! (i) There is no commitment. Turn up one week, don’t turn up the next two weeks and then turn up again. Doesn’t matter. (ii) Turn up at any point, during the evening. (iii) Stay for as little or as long as you want and then get back home in time to cook dinner, watch that show, put the kids to bed etc. 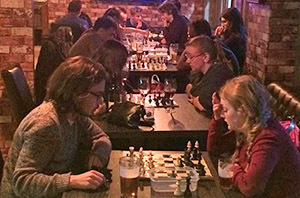 We’re probably the only chess club in Manchester which you can just turn up to unannounced and be guaranteed that there'll be a 200 ECF rated player (one of the highest rated players in the region) who will be happy to sit down and look over one of your games. We run every Tuesday throughout the year (may vary over Christmas period!). We are a genuine Manchester Chess Club! *Rated games: These are competitive games that are submitted to the English Chess Federation for inclusion in their grading system. Such games are always played with chess clocks, are typically around 3 hours long, are played with rules such as ‘touch move’, are played in silence and players have to record their moves. They are great fun, but they are also intense and unforgiving as 3 hours work can be completely undone by one poor move.